In this week’s editorial, Stew Shearer explains why, despite years of feeling shunned by Nintendo, he’s fallen in love with the gaming giant by getting in touch with his retro side. Up until recently I had all but given up on my Wii. It had been collecting dust, resting in my TV cabinet like a neglected puppy. Not the sad, cute kind, mind you; the Wii was the kind of dog that you don’t feel guilty about for not walking. The kind of dog that chews up your shoes, digs up your yard, pisses on your couch and bites when you try to scold it. The Wii was the console that cost me $250, and the one that I barely touched for two whole years. Like many other gamers, I have lapsed into disenchantment when it comes to Nintendo. It’s not that I hate the big N. In fact, I don’t think I could hate them if I tried. They were just too much a part of my childhood to harbor any real ill will to. It’s just that I look at their current strategy and feel a bit left out. Sure, I love my DS, but when it comes to the Wii, I can’t help but feel nostalgic for the good old days, for a time when Nintendo was still trying like hell to court gamers like me. In that regard I suppose I shouldn’t have been surprised when the good old days of Nintendo won me over again, for the past few weeks have seen me fall absolutely in love with the Wii’s Virtual Console. It happened very much by accident. I graduated from college in May, and like two-thirds of recent graduates I’ve been having trouble finding work. To keep the money coming in, I took a summer job doing respire care for my brother-in-law, who is autistic. The job isn’t too strenuous, but it does come with one magnificent perk: he loves to watch people play old Nintendo games. Knowing this, I thought it would be nice to download a few titles for him, namely Super Mario RPG, or ‘Mario Castle’ as he calls it. I’m sure you can guess how the rest of the story went. Upon entering the Wii Shop Channel, I found myself in the middle of a nostalgia trip, and one that left me giddy. I grew up reading Nintendo Power, and just dreaming about playing these classic retro games. That in many cases I never had the chance to was one of the biggest regrets of my gaming life. Suddenly I was being presented with a kid-in-a-candy-store scenario, with tons of great games on sale, costing almost nothing by adult standards. Castlevania 3 and Ninja Gaiden for $5 each? Donkey Kong Country for $8? It was something I’d only have joked about as a kid. Now I was laughing with joy. 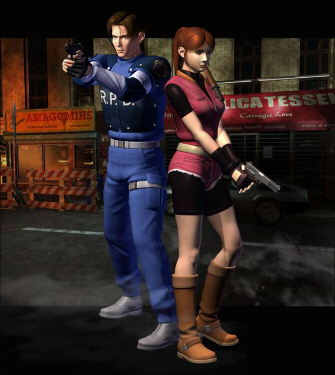 Resident Evil 2 & 3 are coming to PSN, with fans particularly excited about stepping into the shoes of Leon Kennedy and Clare Redfield once more in RE2. I am thoroughly convinced that even if Nintendo has hit all the wrong notes with everything else in this generation, they have struck a brilliant chord with the Virtual Console. It’s common these days to hear older gamers complain of modern games lacking the charm of older generations – but they have a point. Games are becoming far more generic, with shooter following shooter, all featuring bald space marines and buxom blonds. Back when games were young, everything felt remarkable and new. Today the gaming industry has become a well-oiled machine, churning out blockbusters with the ease and speed of the biggest Hollywood studios. The Virtual Console has allowed me to return to that fabled, simpler time of yore, and to enjoy games I had forgotten that I even wanted to play. My point in all of this is simply to rejoice in the fact that despite some of the potentially negative directions a lot us can perceive the industry moving in, and in particular Nintendo, there is a bright side to the picture. To sum it all up, Ogre Battle: March of the Black Queen, one of the greatest RPGs, would’ve once cost me a good $80. Now I can buy it digitally for less than ten. I remember reading about that game as a kid, and sadly realizing that I’d probably never play it, but now that’s all history. So while Nintendo might have done some stupid stuff by the traditional gamer over the past few years, they’ve done enough right by me to love them a little longer, flaws and all.